Come on in, Dobby! I just fixed your potatoes! There are seven kinds of potatoes, today, because I just went to the market! I wish I could take you with me, but I could tell you all about the market if you want to hear about it. Wow! You are really interested, aren’t you! How did you get up there, anyway? Oh, I see! You have a little stool down there. Well, this is Ranch 99 Market, our local Asian supermarket. It is HUGE- in an old K-Mart store. You can buy catfish heads at Ranch 99 Market. You can buy squid, too, in two different sizes! I shop there for the fruits and vegetables. This is durian. You can ask Melly about this fruit. I’m not buying any for you. Even the bananas are interesting at the Asian market. I brought home some little ones for you to try. but I brought home some different ones for a change. The guinea pigs like mandarins, but they like the empty boxes best. Upside down they are the perfect size for hideouts! Here are the sweet Japanese yams. They are dark purple outside and creamy white inside. They are your second favorite. Here are your favorite yams: the purple yams. but they are bright purple on the inside and smell like perfume! you can find at ordinary, boring grocery stores. big eaters like you, Dobby, need a LOT of potatoes! it is so fun to watch you pick them out of your bowl and toss them! Here is your favorite- CORN! I had to ask someone to bring this box out of the back storeroom for you. He said they might not be getting any more this year. Is this going to be one of the weeks when you decide to eat broccoli again? 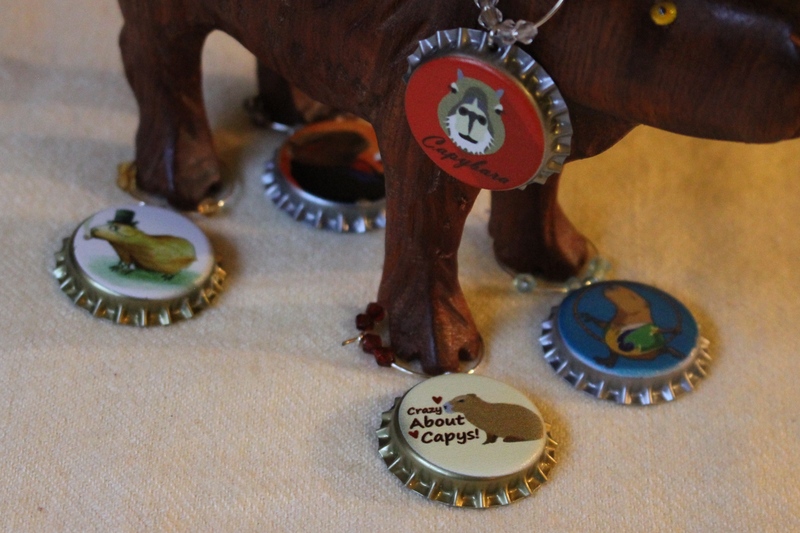 I know some mini-capybaras who will eat it if you don’t! There’s the watercress that I put into your swimming pool! The goldfish like to eat it, too! Look what I found this time! In the frozen foods section! you ate my banana tree in the back yard! When I saw the price, I bought a bag of each. Are you going to humor me and try to eat it? So that is where your potatoes come from! Are you ready to go eat them, now? Get a little bit pouffy, first! What a beautiful display of taters and yams. Dobby's nose = also beautiful.